'Netty's Pride'. Fully hardy to our cold hardy gardens for zones 3, these lovely ladies will bloom in midsummer. Full sun to part sun with good drainage. 3 ft.
'Purple Eye'. Deep rich Tango Series lily. 3 ft.
'Forever Susan'. Rich mahogany wine red tipped with golden orange lacquer, this lovely lily will bring a focal point to any perennial bed. Try this next to the chartreuse foliage of hosta, frilly ferns, crisp white flowers of veronica or Shasta daisies. 3 ft.
'Orange Electric'. Totally....electric! 2-3 ft.
'Arsenal'. Another lovely Mak lily. I'm not sure about the name indicating beauty of some sort, but, Grandpa Frank Heppinstall played inside left for Woolwich Arsenal 1910 season. Good enough for me! Grandma Alice would have loved this one in her new American garden in Milford, Connecticut. 3ft. 'Blackout and Rushmore'. Smooch MacGregor still has pots of wintered over mixed Blackout and Rushmore darkest red lilies. He's nosing the Blackouts here - a classic, very robust and vigorous red with almost black flames in the throat. Rushmore is a clear dark red with both about 3 ft. tall. Those bonus golden buds and lovely glossy green foliage make these a cast iron focal point in your garden. Relatively cat-proof, too! These old-fashioned recurved lilies are making a comeback to the modern perennial garden. 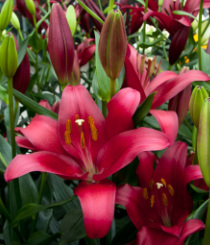 While lily breeders created the up-facing modern lilies for the floral industry's packing and floral design demands, these regal originals nearly disappeared from the general garden market. These Asiatics are more affordable and more vigorous growers than the Martagon lilies. They look much like 'tiger lilies' , but, may only share distant cousin relations with each other. These are taller than modern Asiatics at 3.5 to 4 feet and may bloom a bit later. The modern up-facing lilies are brazenly up front, while these delicate ballerinas hover like shy geisha in antique kimono over your garden. 'Night Flyer'. Canadian breeder, Alex Burnett, registered many of his lilies with names that reflected his time in the Royal Canadian Air Force - Wing Commander, High Flight, Night Squadron. Night Flyer is one of his finest lilies. In our far north gardens she will likely be shorter than her full 4 ft.. But, what a knockout in full bloom and maturity! For full viewing pleasure these dark lilies need to be backed with lighter colors in order to stand out in your garden. Consider placing them up against a wall of late blooming Trollius chinensis 'Gold Queen' or as a focal point in a bed of brighter shades of lilies. 'Sweet Surrender'. Originally raised in the US, this lilies parentage is unknown. 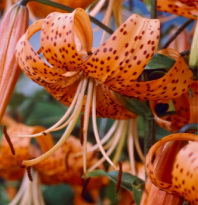 It is generally listed as an Asiatic, but, often offered as L. tigrinum, or a 'tiger' lily. If she presents you with tiny bulbils on the stem she's got close kin to the tiger family. Wait until she's done flowering, then snap the bulbils off and plant them a couple of inches deep around the main stem. You'll be rewarded with babies next season! 3-4ft. 'Pearl Jessica'. The Pearl Series of Tetraploid Asiatic lilies was hybridized by Robert Griesbach. Extra chromosomes not only make bigger movie sci fi monsters, but, they can make some huge lily blooms as well! With twice the number of chromosomes of normal Asiatics you get more large flowers on sturdier stems. Named after Dr Griesbach's granddaughters, these lovely girls will stand about 3.5 to 4 feet tall. July blooms. These lovely modern lilies are Longiflorum Asiatic hybrids. Imagine your Easter lily crossed with an Asiatic lily and often carrying that extra load of chromosomes for larger flowers and sometimes fragrance. They bloom just a bit later than the Asiatics and are often a bit taller. 'Bourbon Street'. Deep rich pink with a hint of white in the throat. 3- 3.5 ft.
Lilium pumilum (tenuifolium). 'Coral Lily'. Native to Mongolia, eastern Siberia, Korea and northern China, this lovely lacquer coral red lily is a delicate iron maiden is lovely in the rock garden. However, she grows in mountain meadows and while she likes good drainage she also likes to be watered regularly. 1 to 2.5 ft. tall. Fragrant. Lilium tigrinum 'Splendens'. The classic Tiger lily made splendid! L. lancifolium or tigrinum Splendens has larger flowers than the native form. At 3 to 5 feet in height this gal belongs in a special garden spot. She will bloom in later summer as your last dancing lanterns in the garden. Lovely against those old-fashioned sapphire blue delphiniums! If you have a good quality photo of this beauty in your garden and would like to share it we'd love to have it right here.